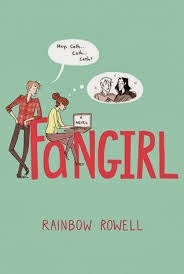 Rainbow Rowell's Fangirl is about Cath,18 year old identical twin, who is forced into the world of college. Her twin, Wren, is trying to make a separate world for herself while at college and all but abandons Cath to navigate the world of freshmen year college on her own. Rowell sculpts the characters very well and even provides Cath with a mean roommate, Reagan with a loveable boyfriend, Levi. Simon Snow is a character from a book that Cath loves to sculpt in the fanfiction world. It sounds like a mash up between Harry Potter, Percy Jackson, and Twilight. I must admit the book flows quite well. It is well written and you truly feel like you are in Cath’s world. Cath is obsessed with a series by another author and enjoys writing fanfiction about the series. She is actually one of those top fanfiction writers and is obsessed with finishing her “Carry On” series before the final book of the series comes out. 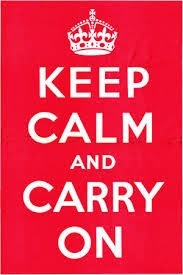 She even has a red t-shirt with Keep Calm and Carry On that her fans wear. Wait, let me explain fanfiction in case you do not understand. Fanfiction is when a writer, average joe, takes an already established series and manipulates it while staying true to the characters on some level and Cath loves to write slash (gay) fanfiction. 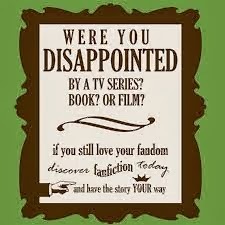 I personally read fanfiction. I will admit I read it at least once a day – Evanovich (Babe), Harry Potter (Dramione), and Twilight (Team Jacob). I understand Cath and Rowell did a fantastic job of catching the fanfiction world while maintaining the world of college. The angst is there and you feel yourself rooting for Cath to overcome her awkwardness and get the guy. She has the ups and downs of a typical college student and there is even an alcohol poisoning moment. I had to step out of my usual genre of paranormal, sci-fi, and fantasy to check this book out. I figured I might as well read it since it has the title fangirl. It’s a great book and a quick read as it is under 330 pages. I might check out other books by Rowell. Pick it up and let me know what you think.